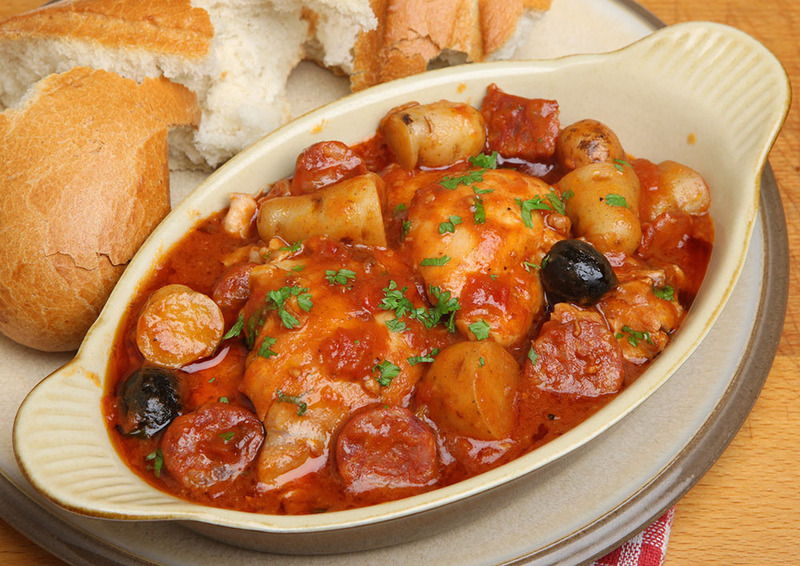 Put a spicy spin on a comfort-food standard with this chorizo chicken stew. Loaded with tender chicken and zesty sausage, this vegetable-rich stew sticks to your ribs and pampers your taste buds. Savor the delicate hint of saffron, bite into the buttery flesh of a tender new potato or enjoy the salty richness of a black olive. All you need is a sliced baguette on the side! Put broth, water, parsley, garlic, onion and carrot into a Dutch oven. Add chicken breasts to the stock. Bring to a boil. Reduce heat. Simmer for 15 minutes, infusing the chicken with the stock vegetables. Remove the chicken. Chop into bite-size pieces, or pull into shreds, if desired. Strain the stock, keeping only the clear liquid. Heat olive oil in the pan and cook chopped chorizo for two minutes. Add the potato, onion and bell pepper. Cook until tender (about 10 minutes). Add garlic, cumin, kosher salt and saffron. Cook and stir for two more minutes. Pour in the reserved stock. Simmer for 12 minutes. Add the chicken and olives; remove from heat after five minutes. Stir in the sherry vinegar. Scoop into serving bowls. Garnish with sprinkle of chopped parsley before serving.